I'm not a maker of cupcakes or sweet fancies, but this recipe intrigued me, because it's quite unlike anything I've seen before. How can a stiff paste of unbeaten egg white and three cups of icing sugar make anything meringue-like? I had my doubts, but was interested enough to hotfoot it to the supermarket to buy several bottles of eye-poppingly bright food colouring. The recipe, which appeared in a local newspaper under the byline of Angela Day (a pseudonym used by the writers of a food feature that is run every week in newspapers of the Independent Group, and which first started in The Star in 1964), was accompanied by a photograph of some dainty, rather flattened pale-pink meringues sandwiched with whipped cream. My enthusiasm turned to frustration within minutes. There wasn't enough egg white to bind the specified amount of icing sugar into a pliable paste. The marble-sized balls of meringue puffed up dramatically, and then flattened out to burnt-sugar discs. Some of them caught fire. Others unfurled and then exploded. I tried shortening the cooking time, but the 'meringues' turned into sticky globs. Those bits that did escape incineration tasted like over-sugared air. But, by gad, I was not going to be defeated. Three batches later, after much experimentation and swearing, I'd used almost a kilogram of icing sugar, covered the kitchen in a sticky layer of goo, and stained my fingers in all the colours of the rainbow. But I had what looked, and almost tasted like, a meringue. The flattening problem was fixed by using paper cups (instead of placing blobs on a piece of baking paper); the explosion issue was resolved by cooking at least six meringues at a time. Six important points about this recipe. - These are not true meringues: their texture is too dusty, they are overly sweet, and they have none of the delicate, billowing loveliness of a proper oven-dried meringue. - You will need to experiment with the cooking times. Every microwave oven is different, and it may take a few tries before you figure out the optimum number of seconds - and yes, seconds count here - it takes to cook the meringues to a perfect crispness. For this reason, I recommend that you make a double batch of the paste (cover whatever you're not using with clingfilm) to allow for mistakes. 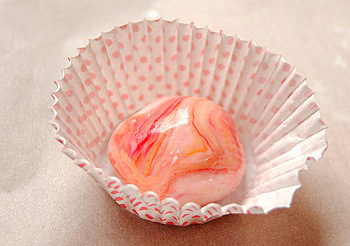 - These are a perfect, last-minute sweetie-treat for birthday parties and cake sales. They are quick to make, and look very pretty, especially when sprinkled, just before cooking, with edible cake glitter. - This is a wonderful recipe to make with kids: there is something magical about the way the meringues puff up, quadrupling in size, as they cook. - These are a great standbye if you're making Eton Mess, or any recipe that calls for crumbled meringues (but do omit the food colouring). - They remain super-crispy for at least 12 hours, and get crisper the longer they stand. Sift the icing sugar into a large bowl. Put the egg whites and vanilla into a separate, small bowl, and whisk very lightly for 30 seconds, or until the mixture is lightly frothed and smooth, with no gloopy bits. Make a well in the centre of the icing sugar, and add a tablespoon of the egg white/vanilla mix. Using a spoon, or your fingers, mix well, adding a little more egg white as you go - less than a teaspoon at a time - so that you end up with a rather stiff, but pliable, paste. If you add too much egg white, and the mixture seems too runny, sift some more icing sugar into the bowl. Add a few drops of food colouring to each hole. Tip the paste onto a board covered with a sheet of baking paper and knead lightly with your fingertips for a minute. Poke two holes, using a fingertip, into the paste. 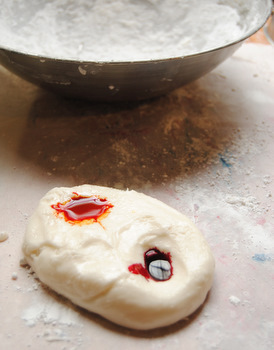 Add a few drops of different food colouring to each hole. Lightly knead the paste again, twisting and turning as you go, to achieve a marbled effect. If you don't want to stain your fingers, wrap the paste in a big piece of clingfilm or put it in a polythene bag. Make the meringues six at a time. Pinch off pieces of the paste (the size of a large marble) and place each one in a paper case. Sprinkle with a little edible cake glitter, if you have it. Cover the remaining paste to prevent if from drying out. Arrange the six paper cases in a circle on the turntable of your microwave oven. Set the time for two minutes, on high, and press the start button. Watch the meringues closely as they cook: after 45 seconds or so, depending on the power of your microwave, they will billow upwards with great flamboyance. Once they've stopped billowing, cook them for another 30-40 seconds (again, you will need to experiment here). Remove from the oven and set aside to cool. They look ever so pretty. I am going to make them this afternoon. Omg. I never thought meringues could be cooked in a microwave! What a great idea! Looks great! Never would've thought you could make something akin to meringues in the microwave! This looks great for a quick treat. What fun....I must have a go! I have been trying to make meringues with a sugar substitute - and what you describe is how they come out! wow interesting meringues - how did you discover this? 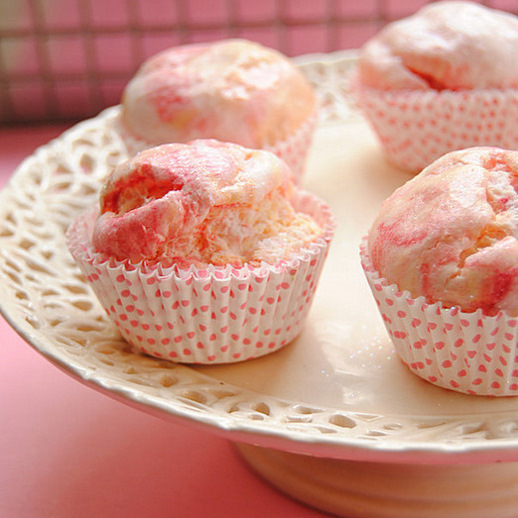 These are amazing - I'll give them a try next time I need to make soemthing sweet in a hurry! I enjoyed your very honest blog, had a good chuckle! "Meringues" in a microwave? Surely now I have seen it all ;-) WHo knew. These look even prettier before they are cooked! This recipe takes me back to primary school when my folks bought our first microwave oven - complete with recipe book which included these meringues. I remember the same trials and tribulations - unlike you we gave up after the third fire! They go look very pretty though. I must admit, I was blown away, when I made this. Its on the menu for tonight, and half of it was eaten by the staff, I managed to save 16 for the buffet. Hope my guest enjoy them. I used different food coloring as well. Thanks for the recipe ! It's very good and VERY fast. Microwaves are a fast and cleen solution for those who don´t have the time to wait a oven coccion or just want to get things done easier. Last year I have lived in an Argentina Apartments and my roommate taught me to use the microwave for cook and now I love it!!! Very helpful post. I must share this article with my facebook account. Thank you.